during college baseball’s dog days he had achieved Zeus like status. In 20 April games in the Blue Raider’s line up Brentz his .694 (50 for 72) with 9 home runs, 28 RBIs, 24 Runs, and 8 doubles. Brentz homered in four straight and 4 out of 6 games in one stretch vs. Vanderbilt, Tennessee, Louisiana-Monroe, and Mississippi State. The sophomore is a Knoxville, TN native, and the only game in which he failed to homer in that stretch was in his home town vs. the Volunteers. The 6’0 also made four starts during the month, the best of which was an 8 inning effort with 9 strikeouts against just one walk in a 13-3 win over Sun Belt Conference rival ULM. Brentz finished the season with a modest 5-3 record and 4.57 ERA, but consider this: In his four starts as MTSU’s #1 pitcher Brentz struckout a combined 21 opposing batters. In 230 at-bats in the 2009 season Brentz fanned just 32 times himself while leading the nation with 28 home runs. By season’s end Brentz had put-up just sick numbers. He led MTSU with a .465 batting average, 28 home runs, and 73 RBIs with a .930 slugging percentage and .535 on-base percentage for a 1.465 OPS. 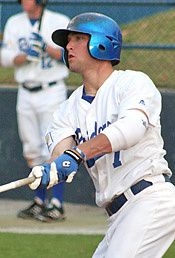 Brentz tied for the NCAA lead with 28 HR in '09. His HR total tied with Alabama’s Kent Matthes for the NCAA lead, his slg % was tops in the nation by 68 points over the next closest hitter, and his OBP ranked fourth among individual batters. Collegebaseball360.com Editor, Sean Stires, talked to Brentz just after his spectacular month of April. CLICK HERE to listen to that exclusive podcast interview. 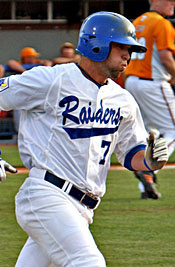 Brentz’s efforts helped Middle Tennessee State win the 2009 Sun Belt Conference Tournament and a trip to the Louisville NCAA Regional. He played for the USA Baseball Collegiate National Team over the summer with the likes of Florida State’s Tyler Holt, Michael Choice of UT Arlington, Yasmani Grandal of Miami, and Christian Colon from Cal State Fullerton.